Oak Tree Intermediaries (Pty) Ltd was established in 2010, with our Financial Services Provider (FSP) (License No. 41670) being granted by the Financial Services Board on the 7th June 2010. We officially opened our doors for business on the 1st July 2010. We are the only niche player in Africa in terms of being a Reinsurance Broker who deems Life, Health and Accident classes of business, as our core focus. Geographically, we service the Sub Saharan region, including the Indian Ocean Islands. Whilst our initial focus was to focus mainly on Life, Health and Accident classes of business (as well as Travel and Entertainment), we soon realised that we needed to diversify if we were to grow. After several approaches from Clients, we are proud to say that we are now able to offer Reinsurance support in all classes of insurance. We are more than able to assist in all Short-term classes, in areas such as Property, Casualty, Liability and Miscellaneous Accident. No job is too big for us!!! Another area of particular focus to us is in assisting Underwriting Managers (UMA's) with their Reinsurance arrangements and structures, either Facultatively, or on the Treaty side of things. When it comes to Cell Captive Solutions, we are in a position to assist clients both from a South African perspective as well as feeding from Africa into Mauritius. Other off-shore captive options are available too! 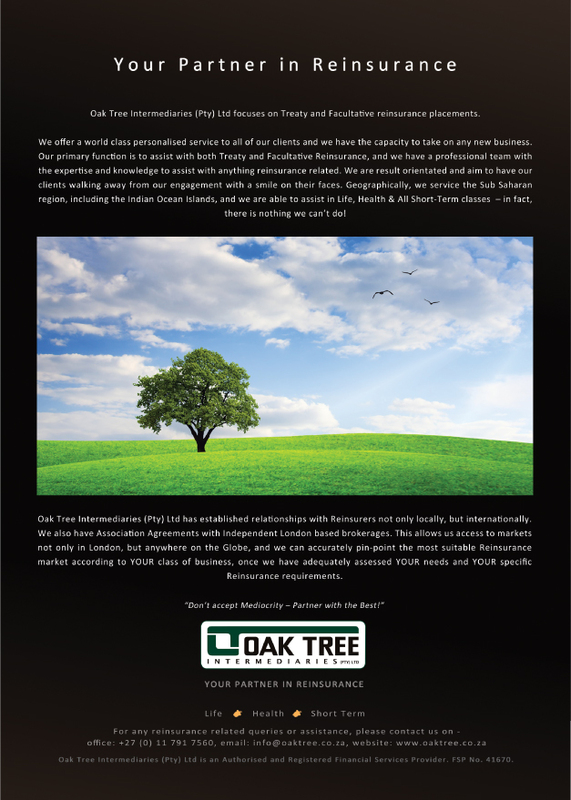 Oak Tree Intermediaries (Pty) Ltd has professional and established relationships with Reinsurers not only locally, but also throughout the globe, and we can pin-point the most suitable Reinsurance market according to the Client's class of business, once we have adequately assessed the Client's needs and their specific Reinsurance requirements. We pride ourselves with our relationships with both Clients and Reinsurers. Growth outside South Africa is another area of focus for us. We have the technical expertise and knowledge of the African continent, so we are able to go the extra mile for our Clients. The FSB is an independent institution, established by statute to oversee the South African non-banking financial services industry in the public interest, and fully.